Look for the green print friendly at the bottom of this post. This dragon pattern was released as a crochet along. 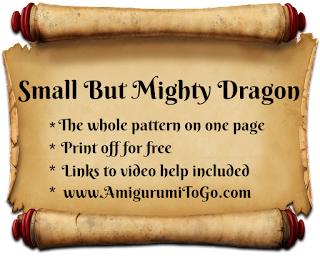 It's a very detailed pattern that was released in 7 parts (see part one with links here). 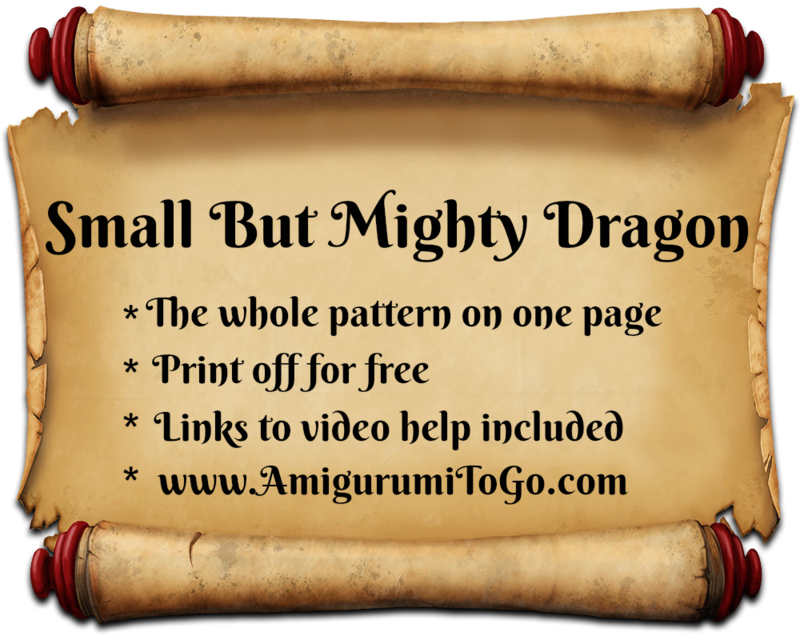 I have copied and pasted the text of the pattern and some of the photos and tips from the crochet along below. worsted weight yarn. I used Red Heart Comfort yarn. sl st next st and f/o leaving a tail for sewing. Sew the edges closed, sew just on the inside of the V's of the last row, this will give a clean edge. 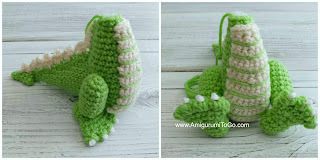 Bring the yarn tail to the middle of the last row when done. 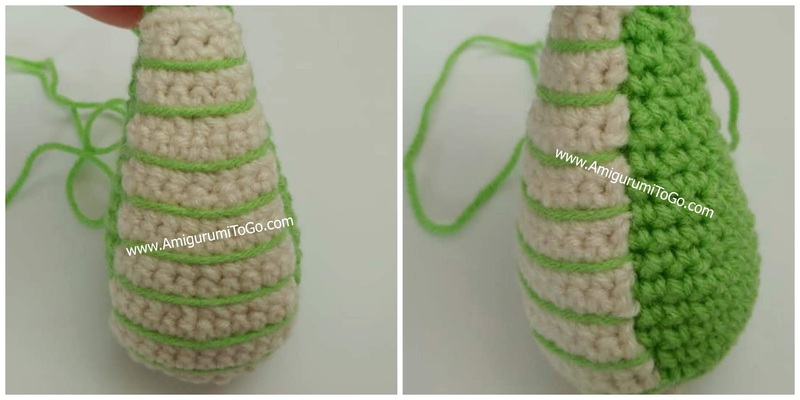 You will use this yarn tail to sew the End to the tail. Stuff the tail up to the last 2 or 3 rows. Do not stuff to the edge. You need a bit of space between the stuffing and the body. Pin the tail in place, the top edge, not the ridge, should be on or about row 13. The bottom on or about row 2. *Make sure the tail is centered. The first time I sewed mine on, it was all wonky and I had to cut it free. Save yourself the trouble of going through that by ensuring it is centered now. Whip stitch around. 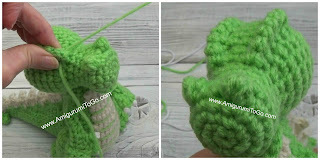 Keep the stitches close together so the seam is neat and clean looking between the body and the tail. Once the tail is sewn on, continue the decoration up the back. This video shows how to joint the legs. Optional, switch to a smaller hook (3mm-3.5mm) for a thinner horn. 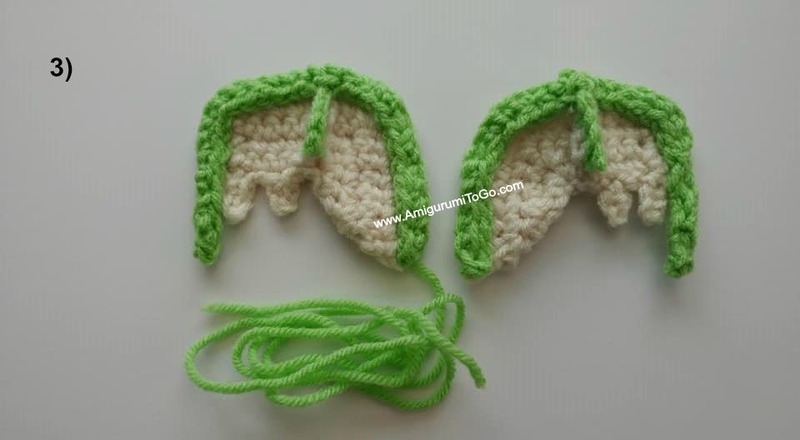 Also, if you plan on using a wire like I did, begin row 1 with a long starting yarn tail. You will use it for sewing the wire in. You could put the 2 ridges a bit further apart than I did. Keep in mind you will be adding eyes so leave room for those. 6) Sew the ears on or about row 15. Again, play around with different ideas. Maybe you want horns just above the ears. I did not design left or right for this main part of the wing pattern. Once the wings are fully assembled, you will not notice that one is flipped and has a slightly different look. *when you go through a chain make sure to have 2 loops of the chain on top of your hook. This will make it easier when you work row 7. Also, the chain right after the one you put 3sc into will be hard to get into, it might even be hard to find. Make sure you get into that ch. 6) ch1, continue working along the edge to the left, 1sc in the next 3 spaces across the edge. 7) Continue working along the bottom of the wing in the visible outer loops. 1sc in the first loop, ch4 then 1sc into the bottom of the ch, sl st the loop under the chain, sl st next 2 loops, ch3 then 1sc into bottom of the ch, sl st the loop under the ch then sl st the remaining 8 loops. f/o and leave a tail for sewing. Sew the corners back, the corners under my thumbs. Leave a bit of space between edge 1 and edge 2 so you can crochet around edge 1 in the next step. 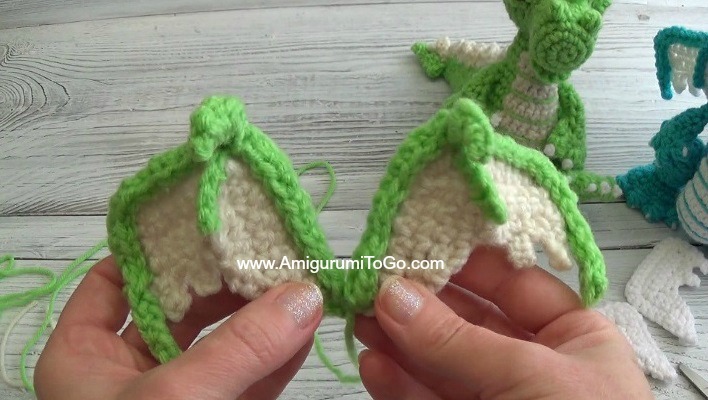 This video shows how to outline both wings. For this part we will do each wing slightly different from each other. 1) insert body color into the corner (this corner will be sewn to the dragon's back). ch1 then 1sc in each st around, stop when there are no more visible st left, you'll be at the start of the picot st. ch6 *see design option below. The chain 6 in step 1 is optional. The chain is a bit fiddly to work with. Keep in mind you will have to do the other wing as well. You could shorten this chain to any number you want. I talk more about this in the video. If you were to ch4 instead of 6, then starting in the 2nd loop, 1sc in the next top 3 loops. 3) pinch the middle of the wing and sew to hold that pinch. Weave in yarn tails. 4) insert the body color into the top of the ridge, ch1 then 1sc 4 times down the surface of the ridge, crochet around the starting yarn tail. Don't crochet too deep into the ridge or you will see the colored yarn on the back side of the wing. Weave in yarn tail. 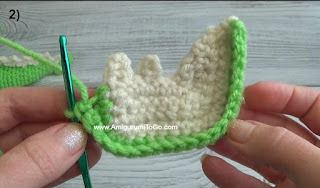 5) using the finishing yarn tail of the outline to sew around the outline. When you get to the ridge, sew through the top of the ridge connecting the outline and the ridge together. When you get to the chain, sew the outer loops of the chain together. Sew as neat as possible through the chain, don't pull the yarn tail too tight as this will cause the chain to get bumpy and untidy looking. Then sew back around the outline and finish off in the corner you started from. 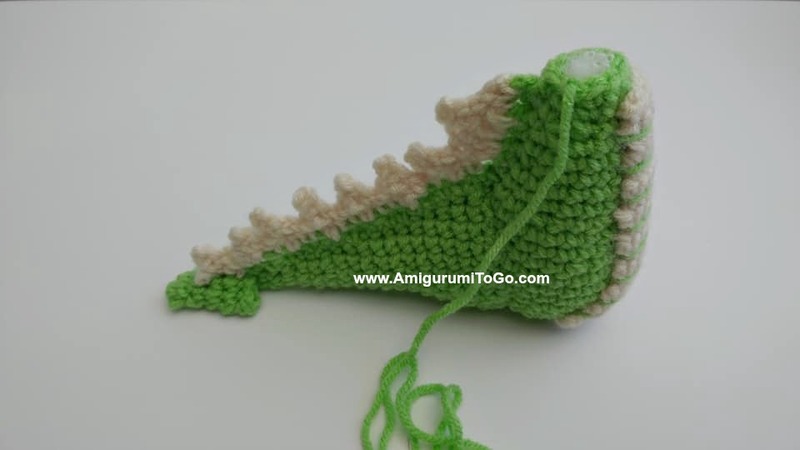 Leave the yarn tail for sewing the wing to the body. 2) working in the BLO, skip ch, 1sc in each st around. When you get back to where you started, ch6 (or the number of times you chose for the first wing), starting in the 2nd loop 1sc in the next 5 loops, sl st into a solid stitch of the wing. 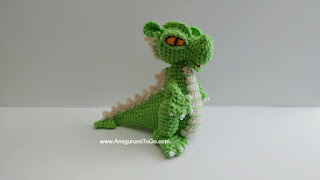 f/o leaving a long tail for sewing. 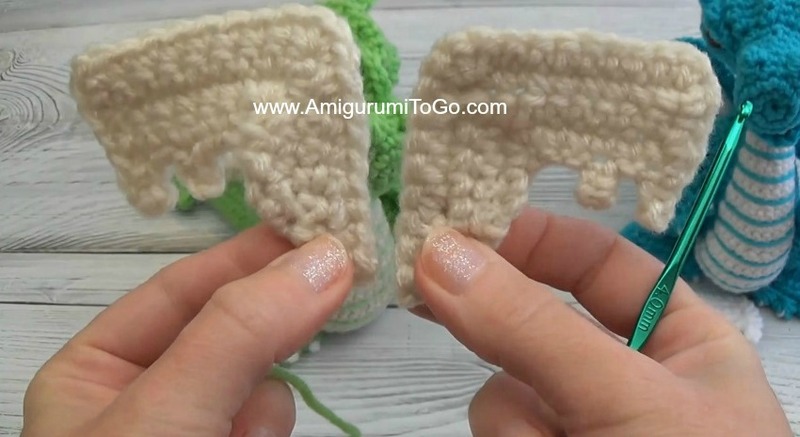 Sew the outer loops of the chain together just as you did for the first wing. 3) Make a ridge in the middle and finish the wing off just like you did the first wing. Flip the claw over so the starting yarn tail is on the opposite side furthest from you, cut it up shorter than the claw. 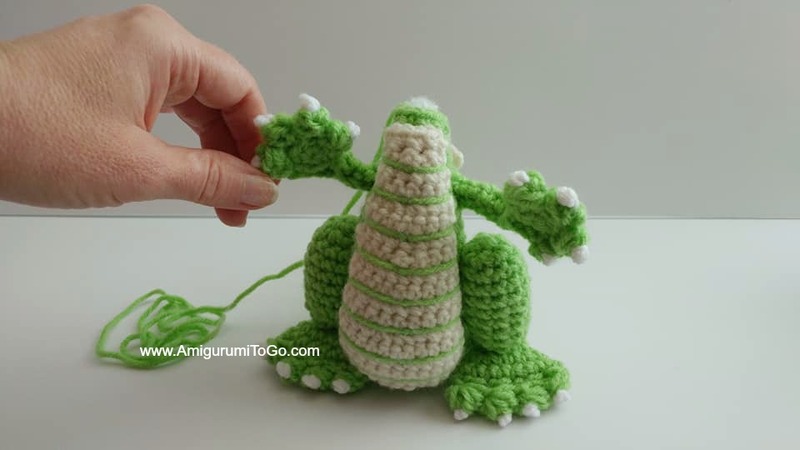 Lay the starting yarn tail inside and fold the claw in half so the edges touch. Whip stitch the outer loops together, knot off at the end and leave the yarn tail for sewing. Sew claw to the top of the ridge on the wing. 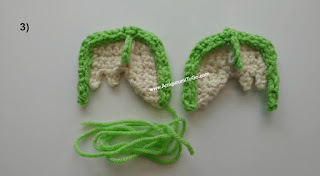 Sew the wings to the body. Take you time to get them just right. Pin them in place and look at all angles. Once you are happy with how they look, sew them in place. Fire: The instructions for fire is here. 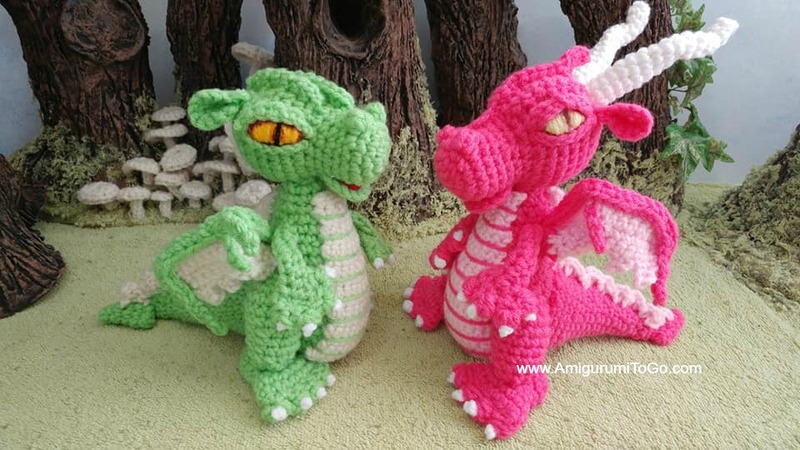 This is a realy great dragon! Thank you very much for the pattern! Thank you so much for such a wonderful pattern! 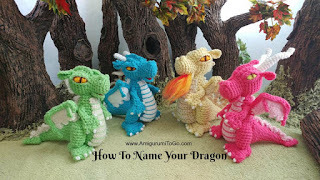 Thank you so much for this pattern and for your videos! 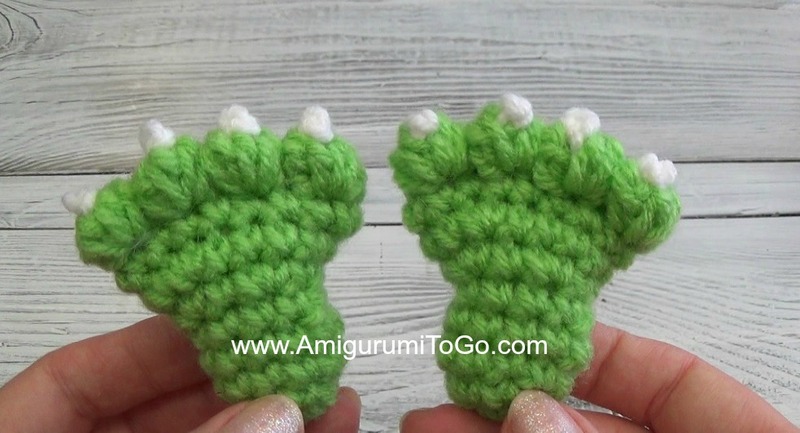 I learned to make amigurumi by watching your videos. 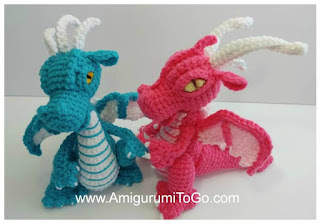 hi, I'm in love with your dragons, I have to make them absolutely! I'm reading the instructions slowly, I don't know English very well (I'm Italian), but I think I can succeed. now I take a ride on your blog, it's really interesting!